It is often said that, in polite company, one should not discuss politics and religion. Samizdata does not pay heed to the first one and Brian and Jonathan have blown the second one, so I should be on safe ground. 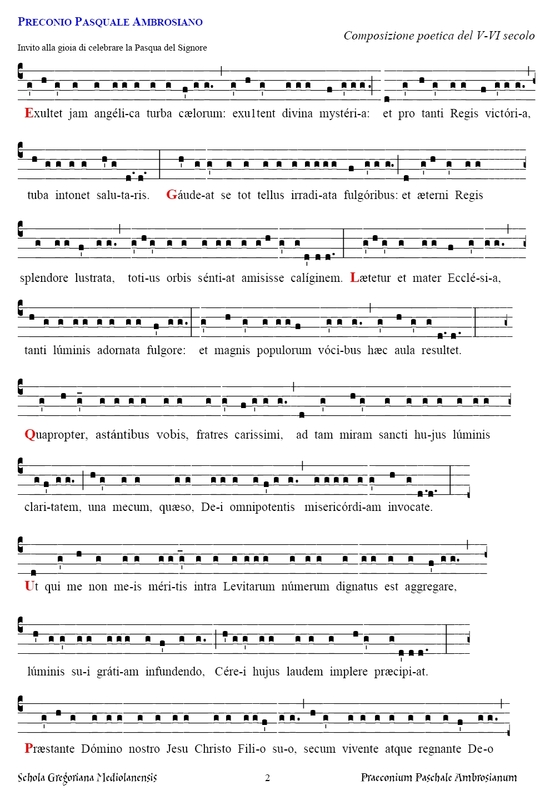 Exsultet of Easter Vigil is certainly my favourite piece of both poetry and music, with Allegri’s Miserere coming close second. 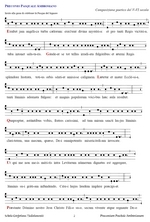 The orignal text, going back as far as St. Ambrose (4th century), entered the Roman tradition around the 9th-century as part of Gregorian chant tradition. It is a masterpiece of the liturgical tradition. It is said to be the sublimest expression of joyful sound that has ever come from the human heart and mind. Mozart once said that it is the most beautiful music ever written and that he would have given all his works to be able to say that he had written the first line of the Exsultet. I could not find a decent audio file that conveys its full beauty and impact, but I found the text and the music score. Update: Here is an audio recording of the Latin version. How nice to read a post about something that really matters. Happy Easter, Adriana. Mozart was generous, but his setting from the Coronation Mass which opened our Eucharist at the Chapel Royal this morning (standing room only, BTW) runs Exsultet a close second. And I suspect the opening of the former USSR to democracy and freedom of expression (that’s my Paschal peace offering to libbo atheists) will introduce us to a dazzling new world of Orthodox chant. I now look forward to the first performance of the oratorio “There’s Nothing Out There, You Superstitious Gits”. Music by Marilyn Manson, libretto by Johann Hari. Thanks for the audio of the Exultet. Happy Easter to all Samizdatistas and those who love them, especially the ones who don’t believe in it. Makes a change from Ressurection by PowerPoint this morning. I am not theologically inclined, but I did enjoy Exsultet; thank you for sharing that. Anyone know of a good recording of this music? Thanks for an eye-opening post. I’d always thought it was a subversive tribute to the Argentinian missile that sunk the H.M.S. Sheffield. Apparently, cultural ignorance of that magnitude is the reward I get for studying German instead of Latin in secondary school. I’ve always been fond of the Pange Lingua, myself. The original chant style, not the horrible one my church decided to do this year. Great audio, Adriana. Our Karlova Ves church was packed packed with folks every mass, Maundy Thursday, Good Friday, Saturday night; and normal Easter Sunday (children’s mass). The candles on Good Friday were really nice; there was a Procession with the Cross on Thursday. We had already gone to Marianka two weeks before (totally covered in snow!). “The sublimest expression of joyful sound”? With respect, no, no no! Handel’s Messiah and especially the Hallelujah Chorus, every time.